Double Diamond cigars tend to rate best among consumers that have switched from cigarettes to cigarillos or small-sized cigars. 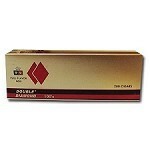 Double Diamond cigars are filled with premium tobacco and the offer a good burn quality and a deep lung hit. While cigarettes have long been manipulated in order to increase nicotine delivery, most options in cigars and pipe tobacco have not. This is why many discerning smokers continue to enjoy Double Diamond cigars long after they have smoked their last cigarettes. 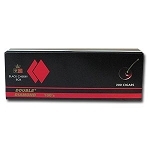 The defining feature of Double Diamond cigars are their shorter than average filters. These measure in at just 10 milimeters while other cigar brands typically feature tips that measure 30 milimeters. This means that smokers are getting a lot more tobacco when puffing on Double Diamond cigars, while still paying the same great price. The signature tobacco blend of Double Diamond cigars is comprised of fermented and dried South American tobacco from countries like Brazil and Mexico. After the tobacco leaves are harvested for Double Diamond cigars, these leaves are exposed to a combination of heat and shade that facilitates fermenting by reducing their internal sugar content without producing rot. Once the leaves have been aged to perfection, they are cut and bundled into tight, little rolls that allow sufficient room for airflow. The results are small, easy-to-carry cigarillos that are perfect for smoking anywhere. Double Diamond cigars are the ideal option for most consumers, given their low price and the rich flavors they provide. Like all small-sized cigars, Double Diamond cigars are perfect for smokers who want an affordable and convenient way to enjoy tobacco while on the go. They are easy to light up on hiking trails and in windy, uncovered spaces. Double Diamond cigars have the look and feel of a typical cigarette but they burn and satisfy just like a cigar should. Consumers also enjoy the broad variety of flavor options that are available. 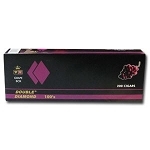 Double Diamond cigars can be purchased in grape, mild, black cherry, menthol and full flavor. These premium, low-cost cigars are machine-made in India.